Christian Olesen, son of Ole Tonne Olesen, a Danish master mariner, was born in Denmark circa 1844-1845. A master mariner is the commander of a merchant vessel and is sometimes called a captain. The earliest record found to date regarding Christian is the 1871 United Kingdom census where he was listed as a boarder in the Weiss house located on Victoria Terrace, Stranton, West Hartlepool, England. Christian was employed as a clerk with a ship broker in town. On August 3, 1874, he married Ferdinande Weiss, daughter of Frederick Weiss and Ferdinande Lehman. The ceremony took place at the Christ Church, West Hartlepool was performed by G.E. Pope, and witnessed by the bride’s brother, Adolph Weiss. (Certified Copy of an Entry of Marriage, Hartlepool, England, 1874, AB 029496) Ferdinande was born on November 14, 1855 in Hamburg, Germany. 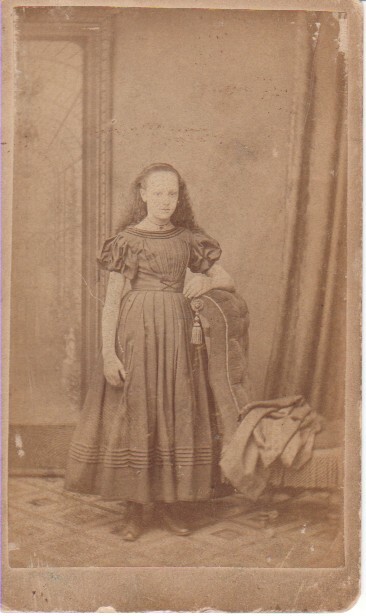 She immigrated to England circa 1859-1861 with her family. Christian Olesen listed his employment as ships chandler on his marriage certificate. A ship chandler is someone who deals in cordage, canvas and other furniture of vessels. In 1881 the Olesen family was living at 47 Redworth Street in Stranton, Durham, England. Stranton was later incorporated into West Hartlepool. Christian lists that he is a ship store keeper. There are three Olesen children; Frederick, Elizabeth and Wilhelm. Christian was not enumerated with the family on the 1891 United Kingdom census, Ferdinande was listed as a wife and not a widow, perhaps Christian was out at sea. The family wass residing at 4 Bolton Street, West Hartlepool and numbers five children; Frederick, Elizabeth, Wilhelm, Emily, Adolph and George. (1891 England Census, Durham County, West Hartlepool, All Saints Stranton Parish, Ref:RG12/4064 Folio:59) Bolton Street no longer exists in Hartlepool, but in the later part of the 1800’s, it was the northern boundary of a large paced open square and was one of the “better” addresses in West Hartlepool. Christian spent his lifetime working on and with merchant vessels. He probably located in Hartlepool as it was the second largest ship building port in the British Empire during Queen Victoria and there still remains a relatively sizable Scandinavian community. I will note here that Christian Olesen is later referred to as Christopher Olesen. I suspect that the change was an attempt after his death to Anglicize his name. Following her husband’s death, Ferdinande remained in West Hartlepool and lived at 7 Bolton Street. Only three of her children are still at home; William, Emily and Ernest. Records show that Ferdinande lived at 73 South Parade in West Hartlepool but by 1920 she was near Liverpool living at 39 Clarence Road, Wallasey, England. Four of Christian and Ferdinande’s children immigrated to the United States, Elizabeth with husband John George Hughes and son, George Henry Hughes; William Christian; Emily with husband Rowland Richards and Ernest with wife Ann and son Oscar. Only one son remained in England, Frederick Adolph Olesen. I have no further information. The greater Pittsburgh, Pennsylvania area drew three of the siblings. Elizabeth Ferdinande and her husband John George Hughes immigrated first in 1906. Second was William C. Olesen, who immigrated to the US in 1910. He returned to England in 1912. Third was Emily's husband, Rowland Richards who arrived in 1914 and joined the Hughes Family. In the summer of 1920, Ferdinande, and two of her children, William and Emily Richards, immigrated to the US aboard the SS Aquatania. I believe that everyone lived with Elizabeth and John George Hughes, 121 Spring Street, Woodlawn Pennsylvania. Ferdinande, also known as Ann, lived with her daughter, Elizabeth Olesen Hughes in Woodlawn and Monaca, Pennsylvania. 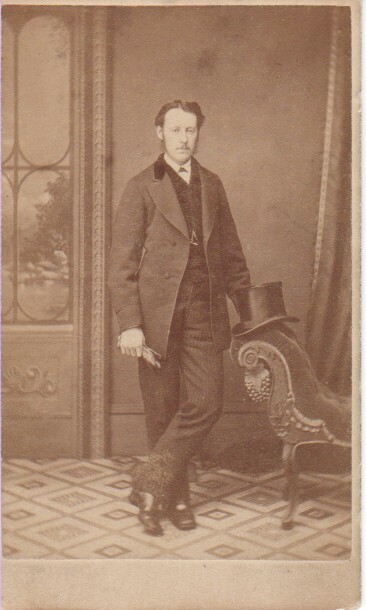 Son, William (Bill), also lived with them. Daughter Emily was married to Rowland Richards and following his death, married Peter Leo Brown and lived one street away from her Hughes/Olesen family in Monaca, Beaver County, Pennsylvania. Ernest Olesen and his family lived in Lynbrook on Long Island, New York. Ann Olesen, called “Granny Olesen,” took a “dose of salts” every day for her health. Her great grandchildren remember her as a quiet and gentle woman. She was a member of the Episcopal church in Aliquippa, Beaver County, Pennsylvania where she had lived for sixteen years before relocating in Monaca with her family in 1937. Ann died on February 14, 1942, at the age of eighty-seven, in Monaca, Pennsylvania from heart disease. She is buried in Woodlawn Cemetery, Aliquippa, Pennsylvania along with her son, William Christian Olesen and daughter, Elizabeth Olesen Hughes. Frederick Adolph Olesen, born March 4, 1875 in West Hartlepool, England. Was living in Newcastle when his mother died in 1942 and West Hartlepool when his brother Bill died in 1946. ELIZABETH FERDINANDE OLESEN, born October 16, 1876 in West Hartlepool, England, died October 11, 1961 in Bellevue, Pennsylvania married JOHN GEORGE HUGHES on June 7, 1897 in West Hartlepool, England. William Christian Olesen (Bill) was born 1880 in West Hartlepool, England and died at age 66 on December 2, 1946 in Monaca, Pennsylvania. Bill was a retired employee of Aliquippa & Southern, a railroad owned and operated by Jones and Laughlin Steel Company. He immigrated to the United States on August 7, 1910 on the ship Celtic. From the time he immigrated until his death, he lived with his sister, Elizabeth Olesen Hughes. Bill is buried at Woodlawn Cemetery, Aliquippa, Pennsylvania. Emily Maud Olesen was born in 1884 in West Hartlepool, England. She married Rowland Richards in West Hartlepool in 1906 and married second, Leo Brown before 1946 in Beaver County, Pennsylvania. Emily lived in Monaca, Pennsylvania during both marriages. No children. Adolph Heinrich Weiss Olesen born April 27, 1885 in West Hartlepool, England and possibly died January 24, 1901 in West Hartlepool, England. George Invart Olesen born December 4, 1887 in West Hartlepool, England and died before 1891. Ernest Alfred Olesen born circa 1892 in West Hartlepool, England. He served as a private with the Manchester Regiment during World War I. In 1915, he married Ann (Annie) Wanless at Christ Church, West Hartlepool. In 1920 the family lived in London, England and Ernie was employed as an accountant. The Olesen family immigrated to New York City on March 7, 1920 on the ship Baltic. In 1924 the family lived at 228 Broadway, Lynbrook, Long Island, New York and records show that they stayed in Lynbrook for the remainder of their lives. There is a social security death record for Ann listing her death as October, 1966. Ernie and Annie had one child, a son, Oscar Ernest Olesen born September 28, 1916 in West Hartlepool where he was baptized at Christ Church. Oscar was a very well regarded Broadway producer, married Theresa "Terry" Fay and had a son and twin daughters. There is now an internet Broadway database listing Oscar as a General Manager of countless Broadway shows beginning in 1952 and running until 1982. His wife, Terry Fay, was with casting. Together they were instrumental in the 1957 show, "Table by the Window", which won the Tony for Best Play that year. The social security death index lists his death as December, 1981 and his residence as Westchester, New York. A blog about a photo postcard featuring Ferdinande Weiss Olesen and her dog. Photo taken in West Hartlepool, England. A blog about Ferdinande Weiss Olesen's Psalm Bible. A blog about how Christian Olesen met Ferdinande Weiss. Marriage record blog for Christian Olesen and Ferdinande Weiss. Unlock the Olesen Family Treasure Chest! A special thank you to my dad, George VanGilder Hughes and my aunt, Faith Hughes Roolf for sharing family memories, old photographs, and memorabilia AND to Heather of Middlesbrough, England who has researched the Olesen roots through UK census reports.